The case has no back and no bezel – but the “TOOL 107” on the back is the key to success! 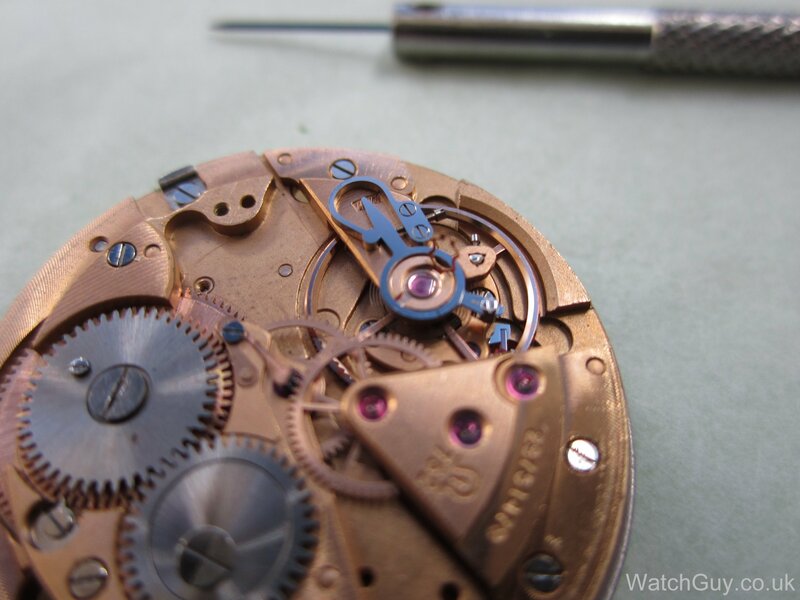 A normal watch crystal remover will do the trick just as well. Entry here is through the crystal. The crystal does not come off easily, and you have to use a bit of force to prise the case from it – but hands only is sufficient. Don’t use anything else as you will damage the case. Next, the crown can simply be pulled off as it’s a split winding stem. 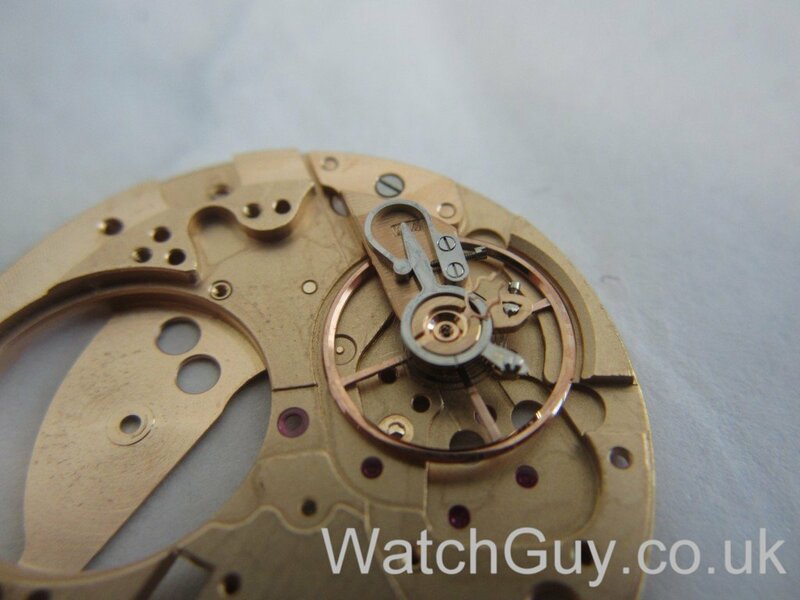 Then press the winding stem back all the way, otherwise you can’t get the movement out. Before taking the movement out, I take the hands off in order to avoid damage. 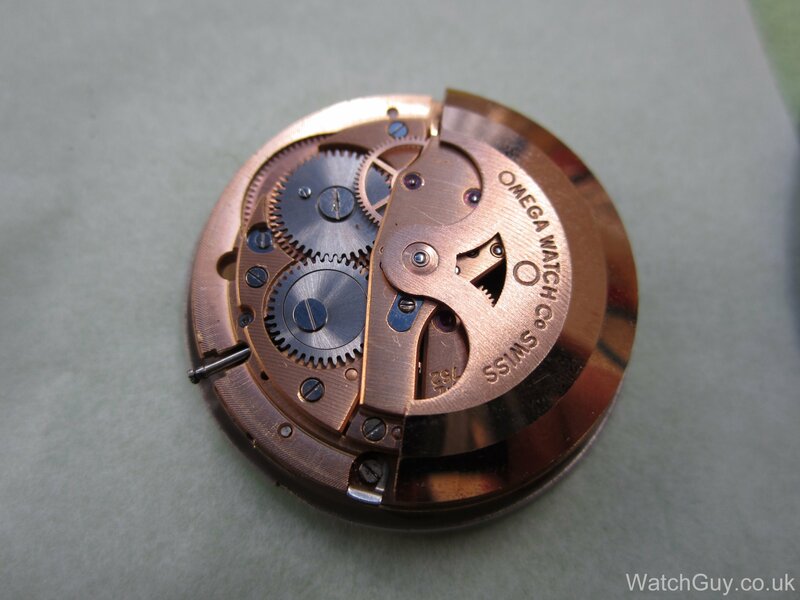 Now you have to turn the movement about five minutes anti-clockwise, turn around the case and the movement comes out – hey presto! 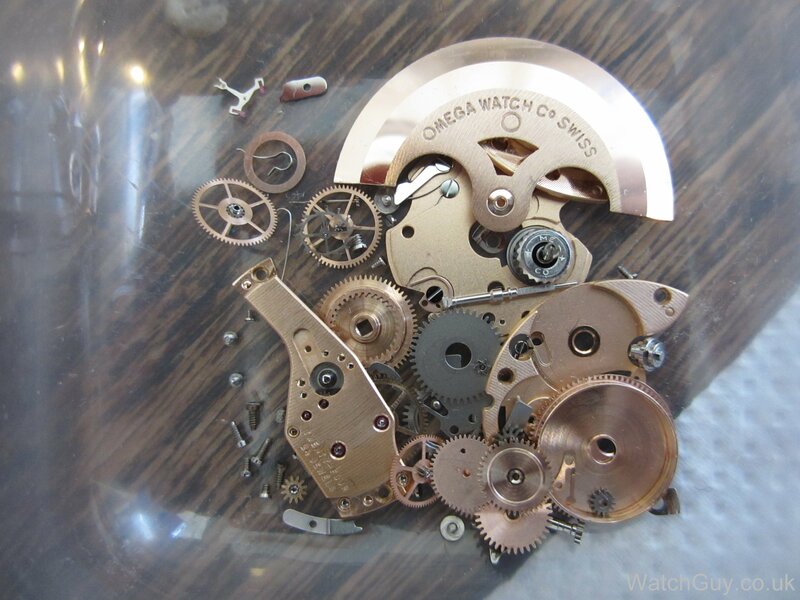 And here it is in all its beauty – the Omega calibre 752. As you can see, the case is just one solid block of metal. I take off the auto-winder assembly. Only the barrel bridge left on the top plate. 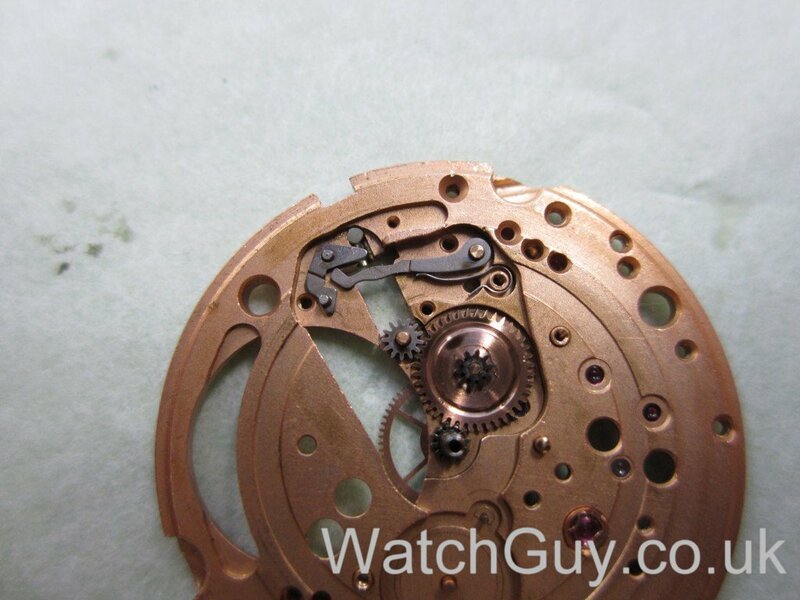 Now I turn the watch around and dismantle the bottom plate. Last but not least, I take the balance jewels out for cleaning. For cleaning, I put the balance assembly without jewels back on the plate – this protects the balance and balance spring. All parts cleaned and ready for reassembly. 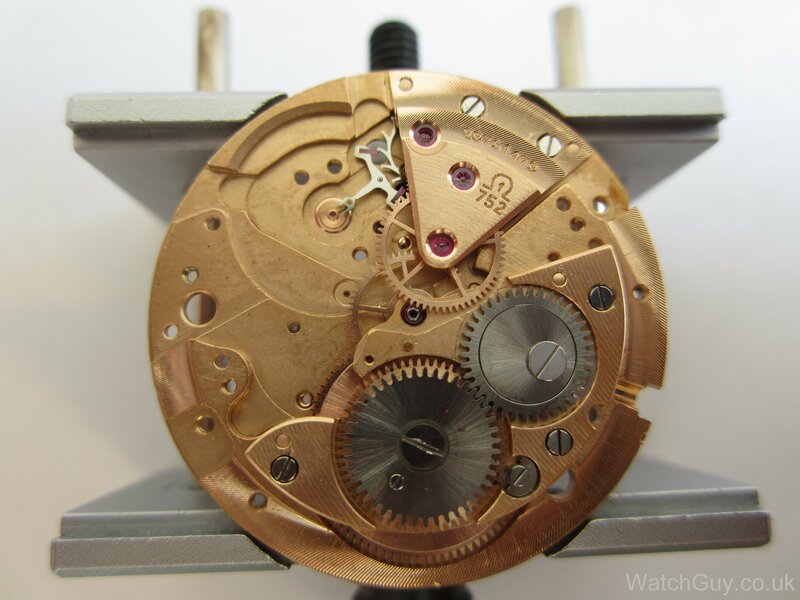 The spring barrel with the new mainspring. After putting in the balance jewels, I mount the centre wheel and barrel bridge. I turn the movement around and start on the bottom plate assembly. The crown has three positions: pushed in for winding, pulled out to the first stop for settting, and pulled out all the way to advance the date wheel by one day. You can see the little lever that does that just left of the 7. The auto-winder assembly goes back on. 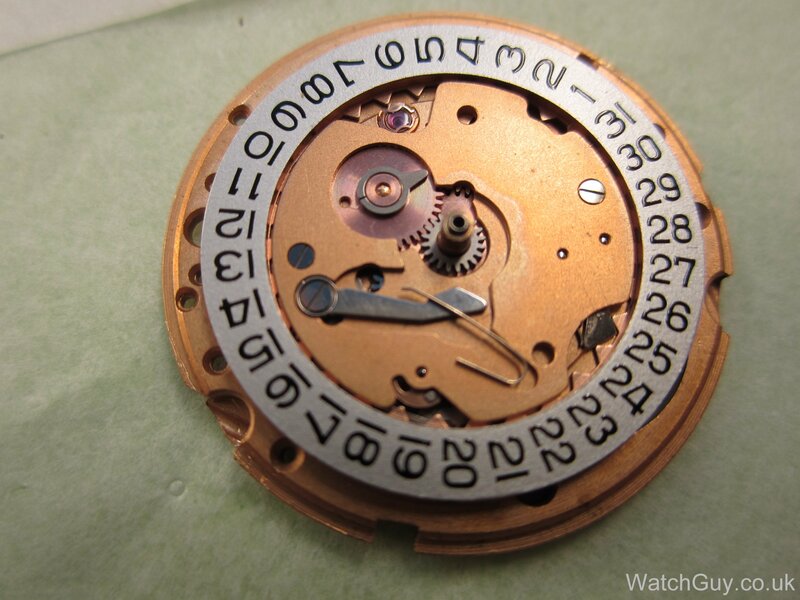 With the dial and hands back on, I’m ready for casing. The hands aren’t in great shape, but there is nothing I can do about that. The case is closed in the same way it was opened. Job done. 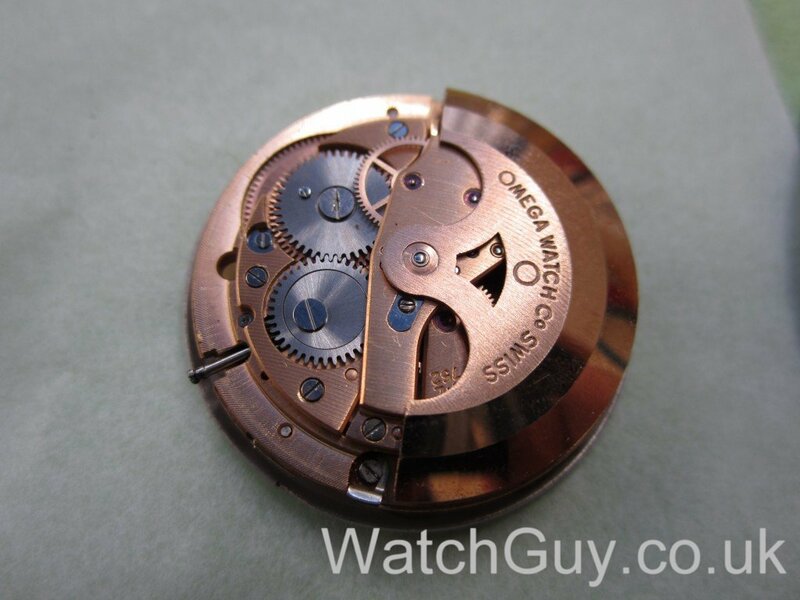 Lovely watch with a great movement. Case, lugs, crown, strap, all three hands, bezel, crystal, dial, as well as all its rubber seals. We have the movement in very fine condition. Stainless Steel. Thank you very much, hope you can help! 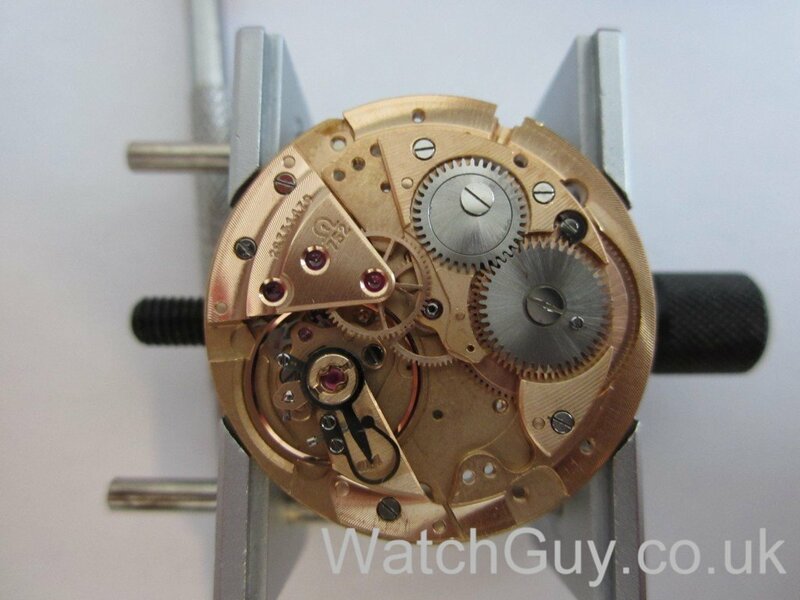 Buy a complete watch on ebay. The crystal has to come off to get to the case number. Find a watchmaker with the right tool (we have it). 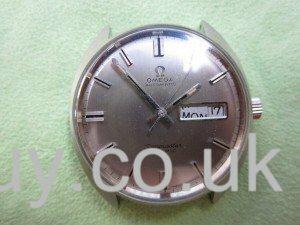 I am looking for below parts for my Omega Cal 752. Can you check if you have stock for this and quote me your price. Hi, please your support if can include onto your pictures a water mark, why reason ? A guy try to sell me the same model of watch in Mexico and include two pictures from your site. This movement doesn’t have a quick set day. You set the day first, then the date with the quick set. Hello, I have a watch identical to yours, the same reference. Could you tell me how much it can be worth? I’m afraid we don’t do valuations. Great Work first of all, i have an Omega Geneve Dynamic 166.079 Cal 752.
it was working perfectly, but now looks like the minutes sometimes stuck, but not all the time. 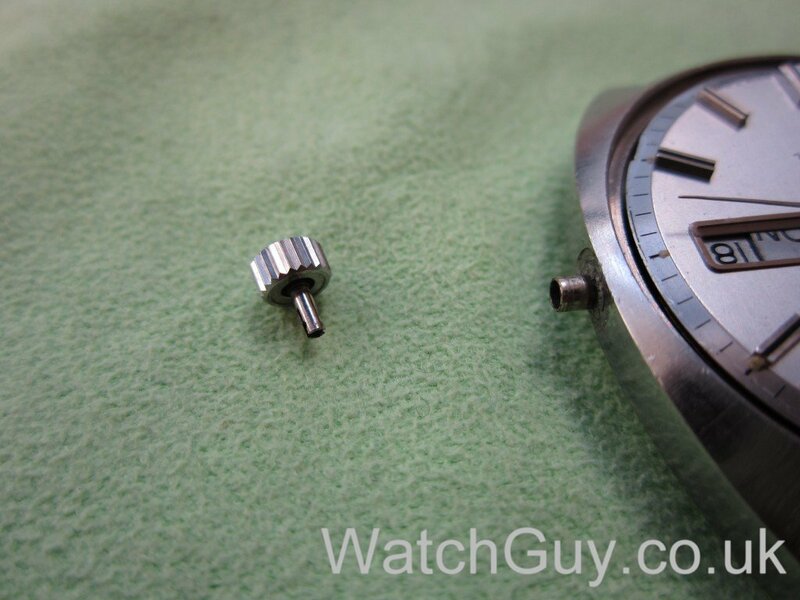 I live in UAE so i wonder if i can send you the watch to fix it, and how much it will cost. Yes, you can if you can get a slot from our booking page. There is a price list on the web site. I have a 752 with gold filled case. (Ref 166.036). I recently purchased a stainless case ref 166.016 and wondered if my 752 movement will fit in the 016 stainless case? I have a question. If you open the case with compressed air, doesn’t it make difficult to insert the front crystal after everything is done? Why would that make it more difficult to fit the crystal? The compressed air does nothing put press the crystal out from the inside. Hi, I have similar watch but mine is omega automatic seamaster cosmic 166022-tool 105 and its gold plated. 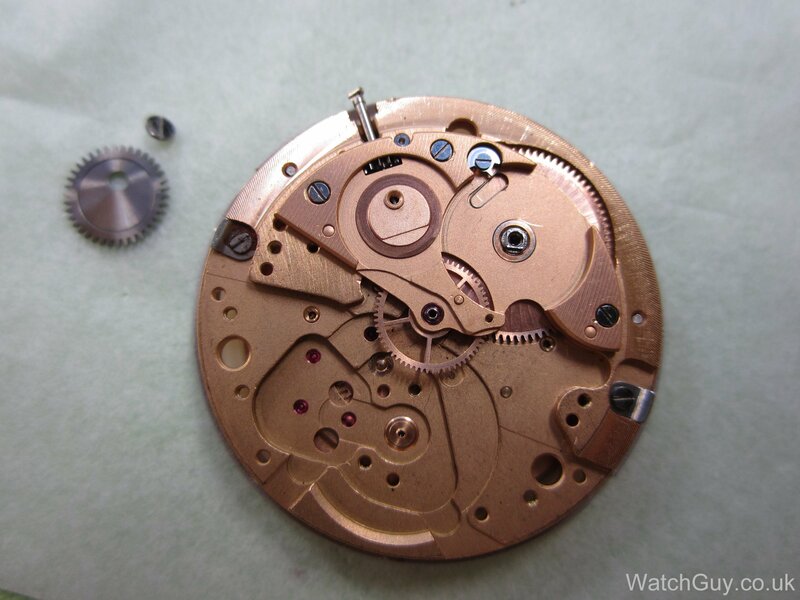 My watchmaker tells me that I need special crystal for it to replace?! and its a bit expensive, so I’m looking and trying to buy one somewhere cheaper. Problem is that I have no clue what sort of part number would that crystal be? 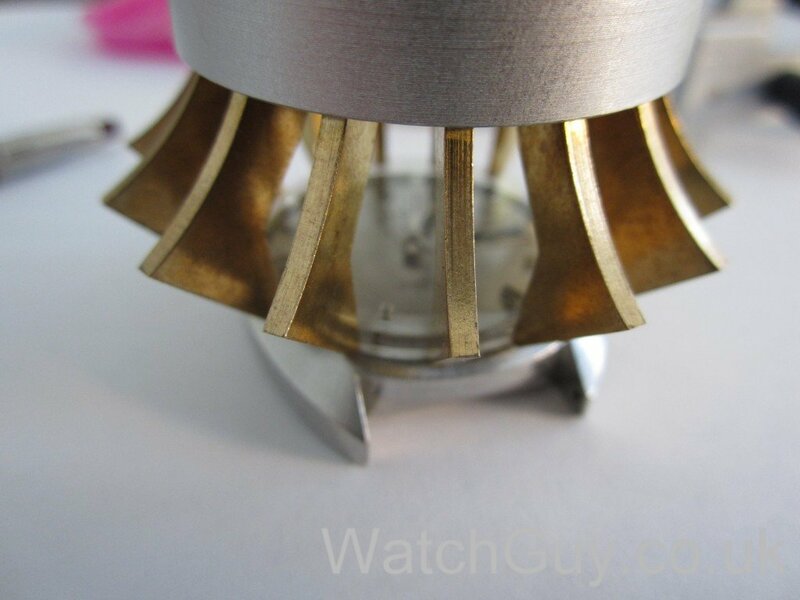 Be a good boy and pay your watchmaker for the original crystal. Yes, they are expensive. Sometimes helping involves a bit of pain…. Hi. Great work on your Seamaster Cosmic. I have the same watch (not working) and plan to bring it back to life. I find your post very valuable to a total newbie like myself. I will not be doing it myself (will have a watch shop do the repair) but it helps to understand what’s going on. I was wondering what limitations kept you from improving the hands? Mine is in the same state. Thanks. 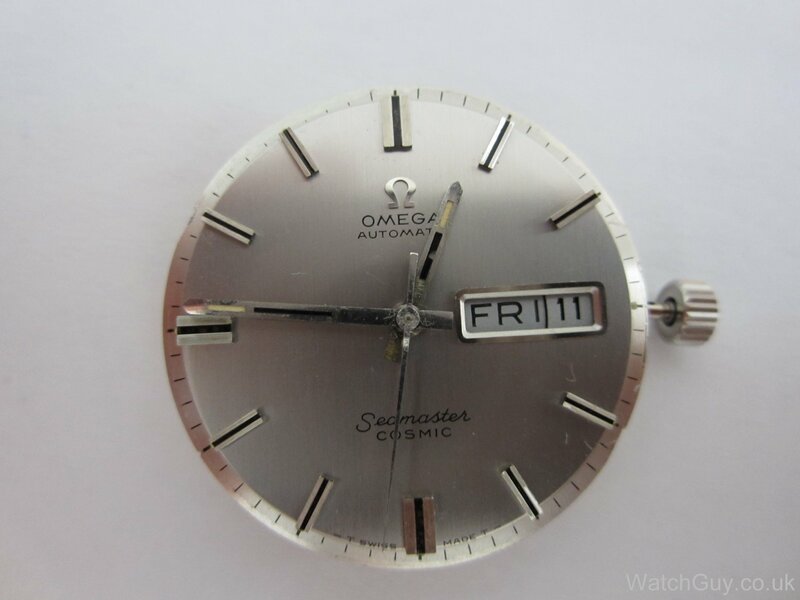 I posted all possible crystal Omega part number for that case… I don’t really know what more information you could want. 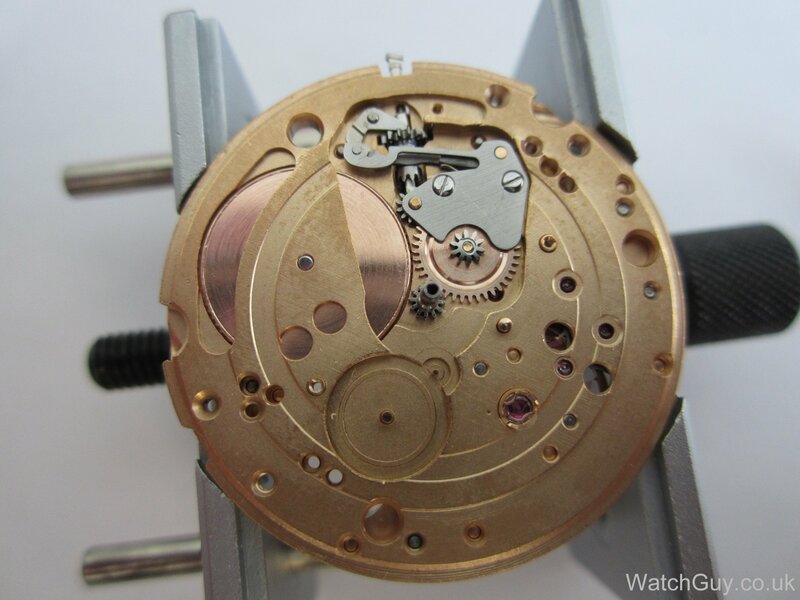 Hi good works , but what crystal in the 166036 calibre 752 ? Sounds to me like the mainspring is slipping. 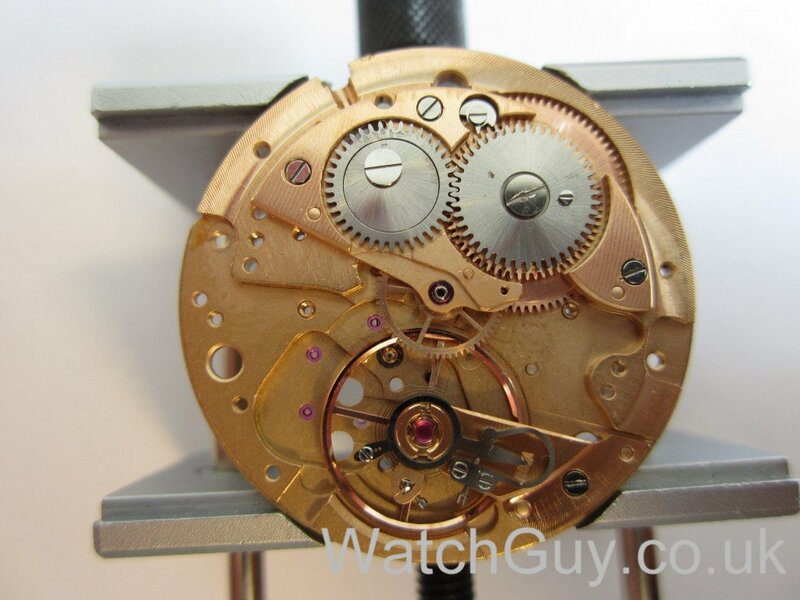 You will need a full service (see price list) and a new mainspring. Does this not have an overwind protection whefe it slips if wound to tight? 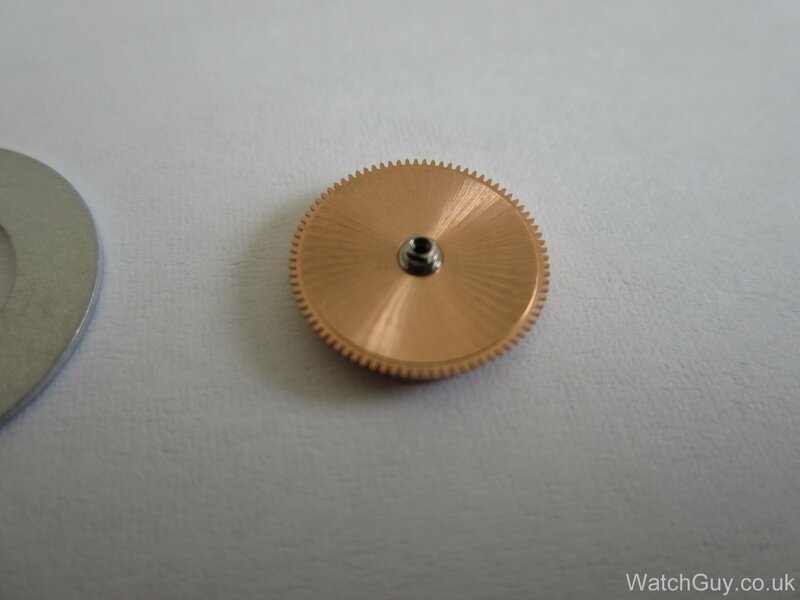 All auto winding watches will have a mechanism that prevents overwinding. In this case, the mainspring slips in the barrel once fully wound. great job. 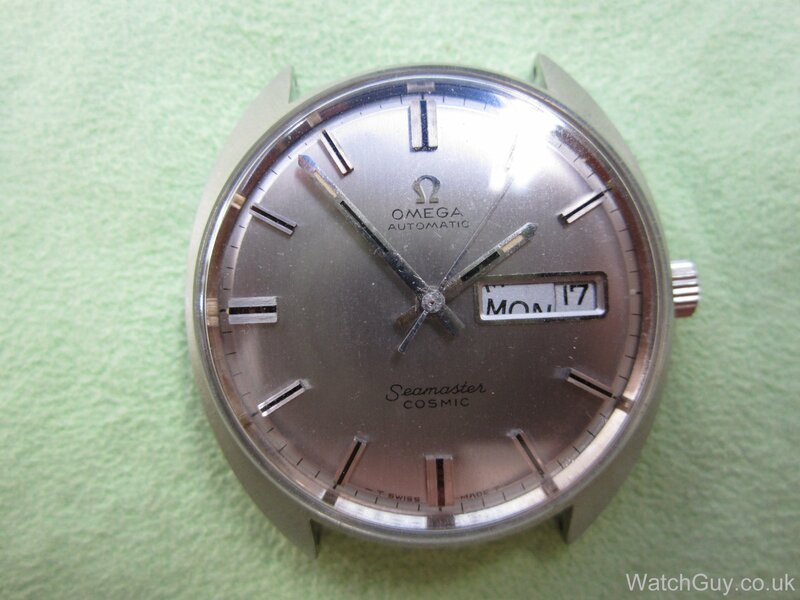 Im a owner of two omega watches Seamaster (case ref. 135.0018) and Geneve (case ref. 166.0163) and need crystals for both with silver ring. What crystals do i need and if you have one do you sell it? As you have the case reference numbers, it’s easy to find the crystals you need. 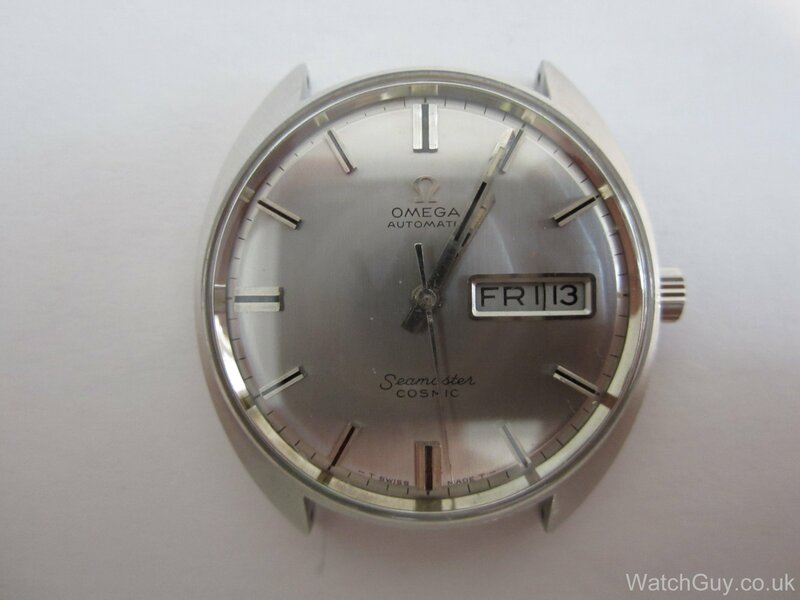 Go to http://cousinsuk.com/, click on the Omega symbol further down the page, and then on “Omega case parts”. Enter your case number, and you will find they crystal. You might have to register on the site to be able to access that. Wonderful post. Thank you so much for sharing! My thanks for your useful and informative blog. 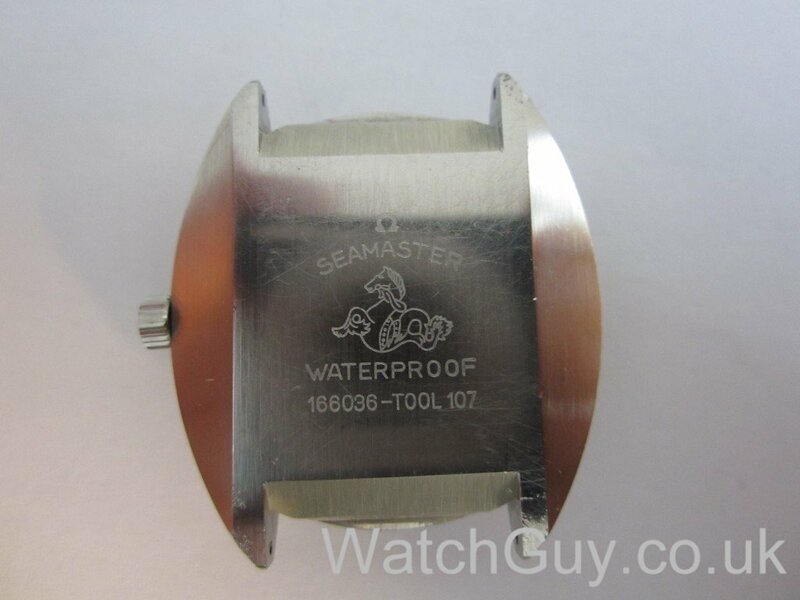 I wish I had found you before I sent my Seamaster Cosmic (166036) for a service. I received it back today after nearly (6 months). When I advance the hands the day and date seem to take a long-time to turn over. The Day finishes changing at around 01:30 and the date at around 04:30. 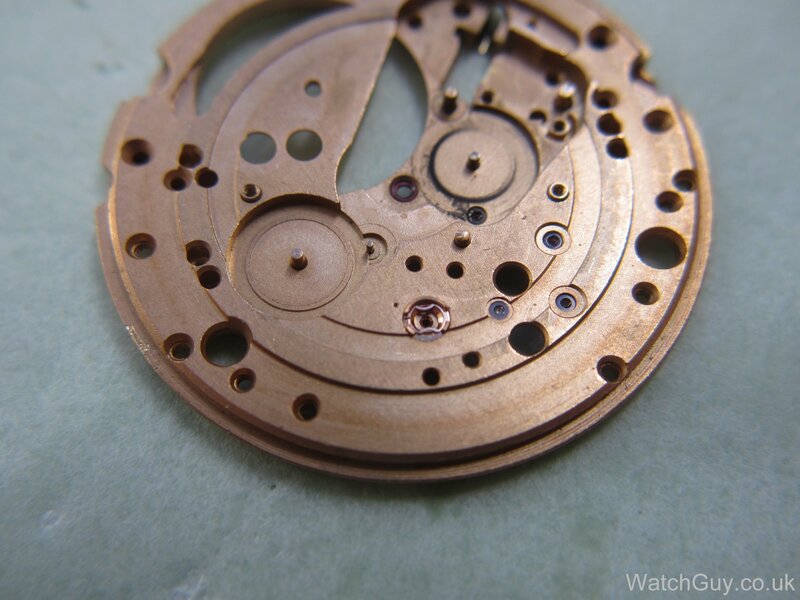 I would be so grateful if you could tell me if this is normal, sadly I have lost confidence in the work done on the watch and can’t remember how it operated previously as it is so long since I saw it last. It sounds like your date dial is a bit bent, and this not moving as freely as it should. 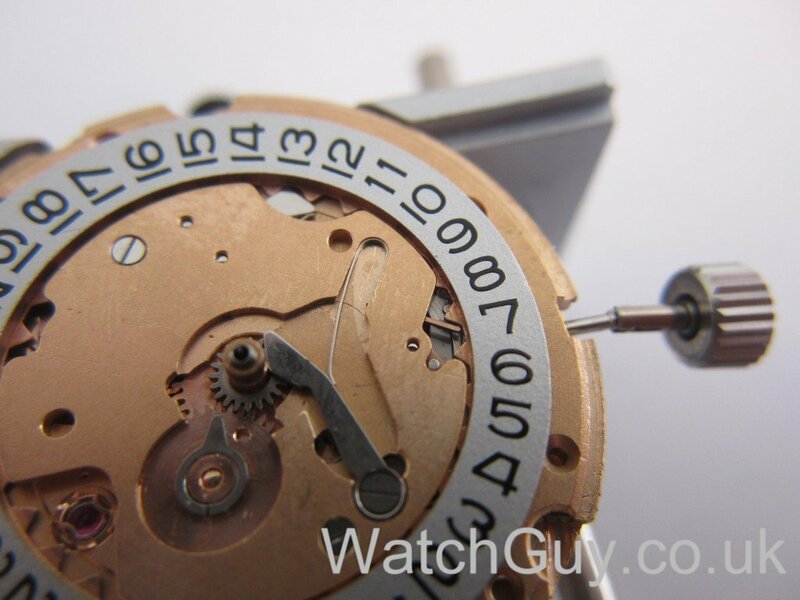 That means that the pawl can’t snap the dial into the next day position, but that it is slowly dragged there. You will need a new date dial. That’s a guess without seeing the watch of course. I really appreciate your getting back to me and for your advise. I will have to see what can be done. As I said I wish I had found you before. If your prognosis is correct could you email me with a quote and some idea of how long it would take . I have a Cosmic which works well, but last night the stem pulled out, whilst changing date, and half fell to the floor. 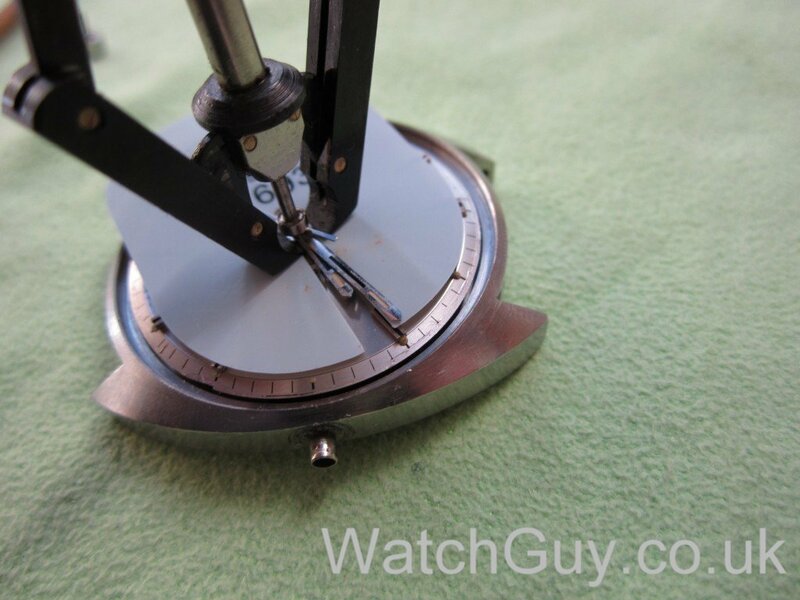 The watch is still working well.How much will you charge to replace the stem/winder? 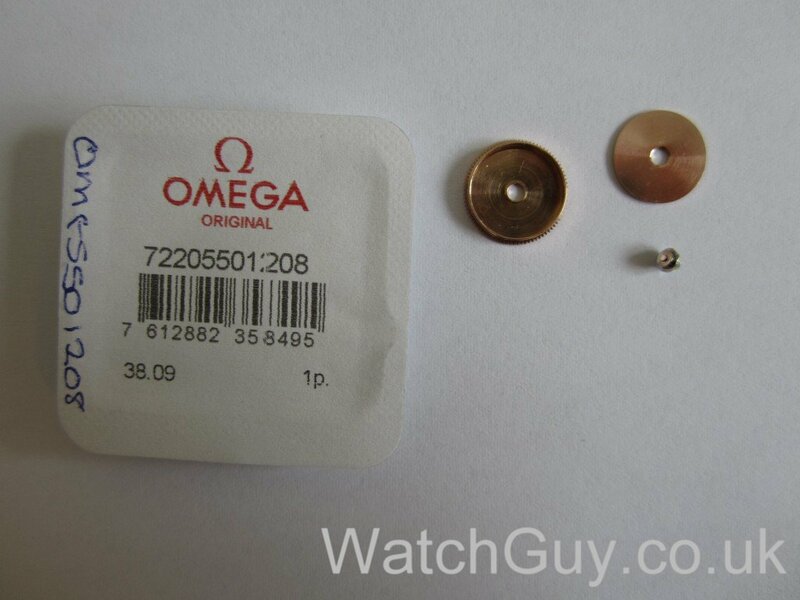 I still have the Omega Button and bit of stem. Bit of a loss really and unexpected. Watch still ticking away happily! I too have a watch like this, and as I was looking for a crown for mine (it was relpaced, but I don’t really like the one they replaced with) and I saw your post (awsome post by the way). 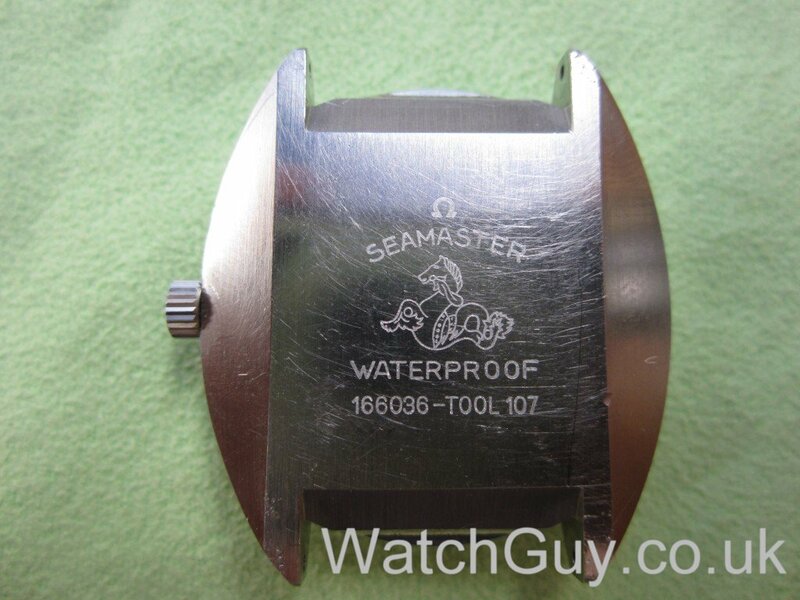 Omega Seamaster 166036-tool107 – the Omega calibre 752. Not sure if this helps David (or if he’s even still looking for it), but that’s the point I am now and will research from these refs to, hopefully, get mine. I also have a gold Omega Constelation 564 that needs a crown and some cleaning service. 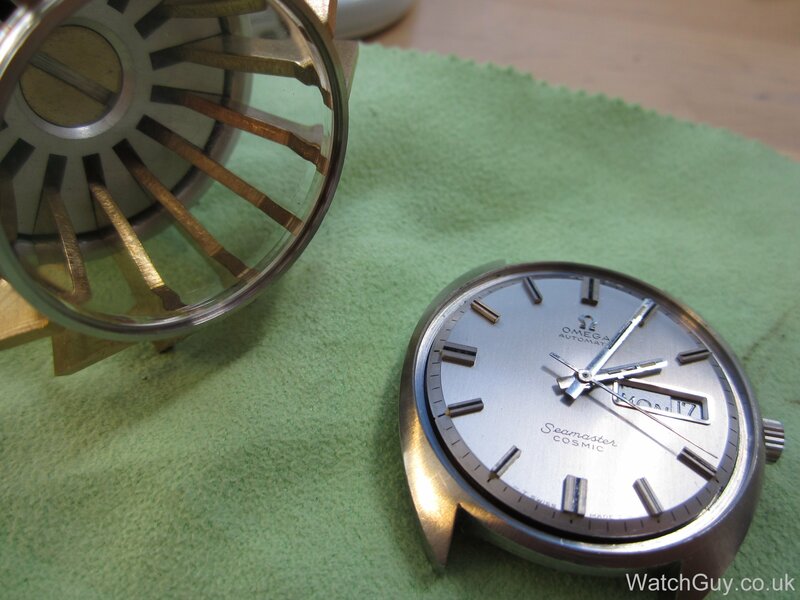 I believe, it ought to be the most compatible Omega Caliber 470 Crown Wheel # 1101 Complete with Core #1102, but then again, I don’t know a thing about these watches, all I know is how to google (and even that…). In resume, my question is if I’m pointing in the right direction or just loosing time? cousins (http://cousinsuk.com/) also has a good selection of Omega crowns. I have the same watch (166036) and also has the same problem. The day and date is stuck. It also runs fast. My question is how much to repair and clean? I’ve sent you an email with a quote. 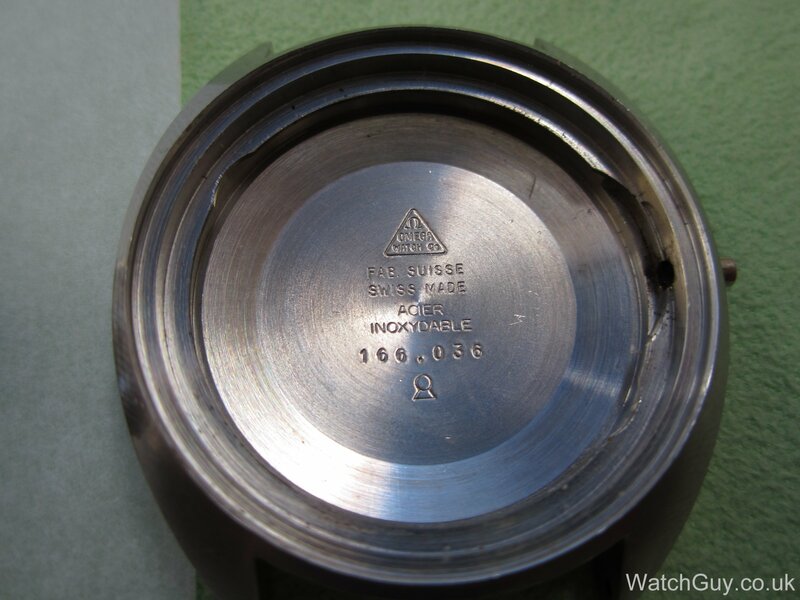 Hi – do you know what type or size the crown is? Mine has fallen off…my watch has the same numbers on the back – no date though. Sorry, the watch is back with the client, so I don’t know the dimensions of the crown. Very interesting. 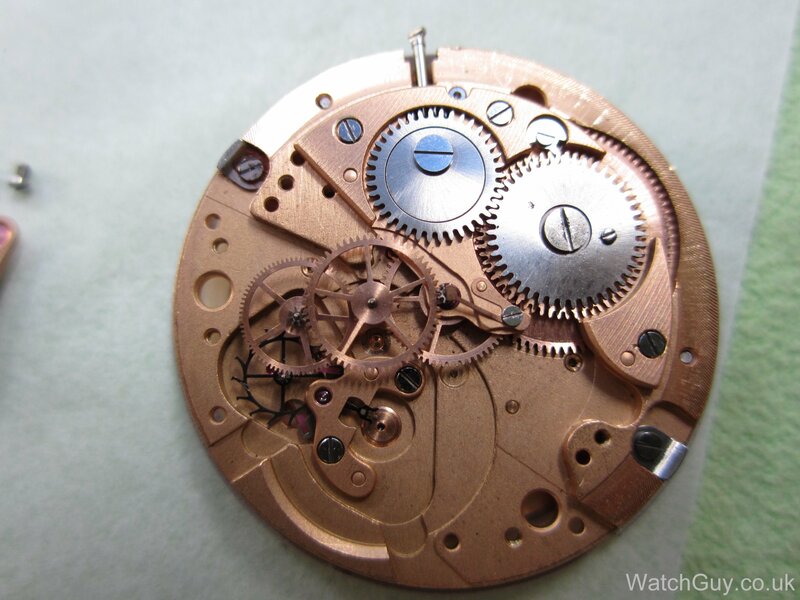 I am curious to know what was wrong with the datewheel, or was it just in need of a good cleaning? 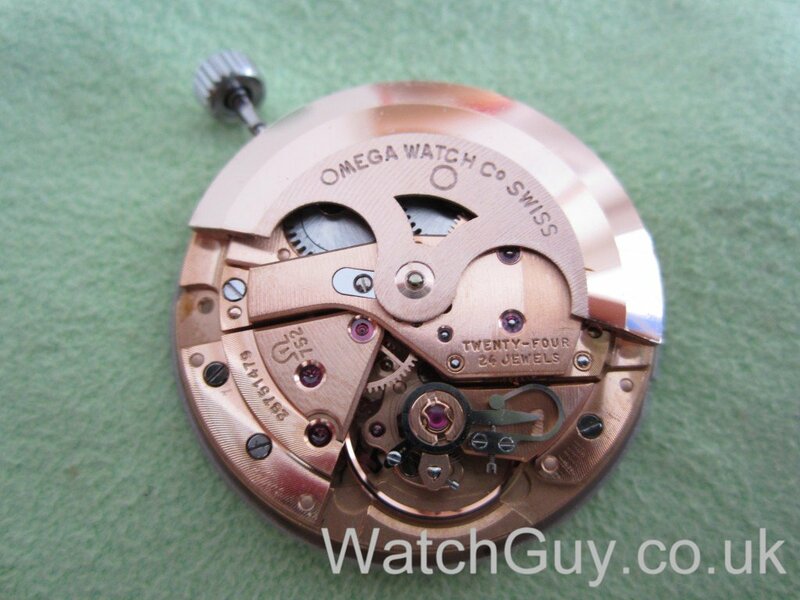 I am the fortunate owner of a simular cosmic seamaster and really like the shape of the bottom of the watch. It took me a while to figure out that the date is changed by pushing/pulling the crown. Thanks for showing this on your site. Someone had actually bent the dial – probably not knowing how to remove it. That led to pressure on the day ring, so it wouldn’t switch over any more.